Hydrotherapy is derived from the Greek word meaning water healing. It is a controlled aquatic exercise in heated sanitized water and combination of warmth helps to relax muscles and helps restore the range of movement in the joints. Buoyancy removes the impact that weight bearing exercise can cause on the affected joints and hydro static pressure reduces pain and swelling, promotes muscle relaxation and improves circulation and healing. We use a state of the art Tudor aqua treadmill. The glass sides allow us to assess each patient, monitor their joint movement, control their exercise and build up an effective rehabilitation programme. The water is heated to between 28-30 degrees which relieves pain, increases circulation, relaxes muscles and aids comfort. The water level is altered to target specific joint(s) and the speed varied to achieve the correct gait pattern for the patient. A strict water testing and treatment regime is followed three times a day, chlorine is used to sanitize the water. First session 1 hour and further sessions last 40 minutes. Please check with your insurance company as hydrotherapy treatment may be included. Some insurance companies limit the number of hydrotherapy session per condition; others will pay up to your insurance limit. Some companies include hydrotherapy under ‘complementary’ treatment whilst others have a hydrotherapy section in the policy. Call you insurer and ask for clarification. You are free to contact us yourself and we will then contact your vet for permission for hydrotherapy treatment. Your vet will need to confirm that your dog is fit and well enough for hydrotherapy and provide details of any relevant medical history. As a qualified and registered hydrotherapist I will never swim any patients without vet permission. 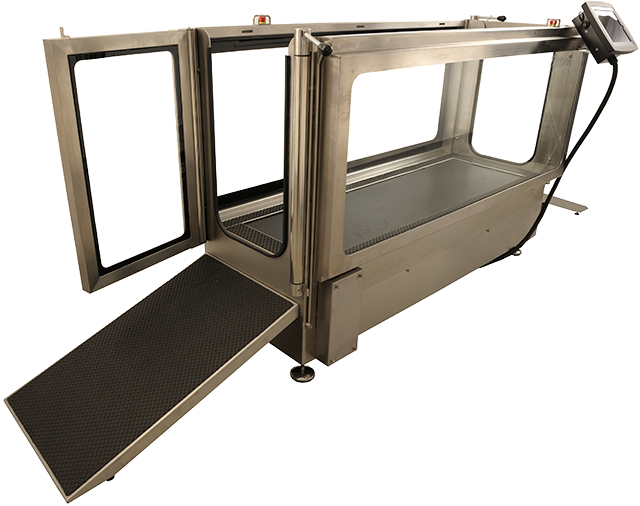 This protects you, your dog and other animals visiting the hydrotherapy centre, it also ensures that the treatment plan is appropriate for your dog. All patients will be showered pre and post session and towel dried before leaving. We also offer the option to use the blaster (hair dryer), if your dog likes this. I ask you not to feed your dog for up to 2 hours prior to a swimming/treadmill session and not to feed them for up to an hour after each session. If your dog has any medical conditions that require medication or specified eating times, we can arrange the best time of day for your dog to receive treatment. Please allow 60 minutes for your first session. This time will allow me to get to know your dog in order to carry out a full health check and discuss your dogs needs. Muscle mass measurements and gait analysis via video will be taken and will be reassessed on the 10th session, these results will be provided to you and your vet. A programme will be written to meet your dogs individual needs. Further treatments will last 40 mins and I will offer non assisted or assisted sessions in the treadmill. The length of the session may vary from only a few minutes as your dogs health and fitness improves. Animals undergoing hydrotherapy require referral by their Vet Surgeon. We also ask all relevant history, details of concurrent disease and medication are supplied with the completed referral form. All patients will have their own written programme and progress reports provided back to their Vet Surgeon.